Cells build up stores of molecules required for growth inside the cell in higher amounts than are found outside the cell. Water naturally wants to flow into the cell to balance the number of molecules inside and outside, but if the cell were to allow this, it would burst like an overfilled balloon. The cell wall allows the cell to withstand this osmotic pressure. In bacteria, the cell wall is made of peptidoglycan, a structure not found in either eukaryotes or archaea. This structure forms a meshlike sac around the cell and provides it with rigidity. Peptidoglycan is made up of polysaccharides linked by peptide bridges. Polysaccharides are long sugar chains of alternating N-acetylglucosamine (NAG) and N-acetylmuramic acid (NAM) units, which are firmly attached together by chemical bonds. As shown, polysaccharides arrange like cables that encircle the cell and are connected by peptide bridges made of the four amino acids L-alanine, D-alanine, D-glutamic acid, and either lysine or diaminopimelic acid (DAP). 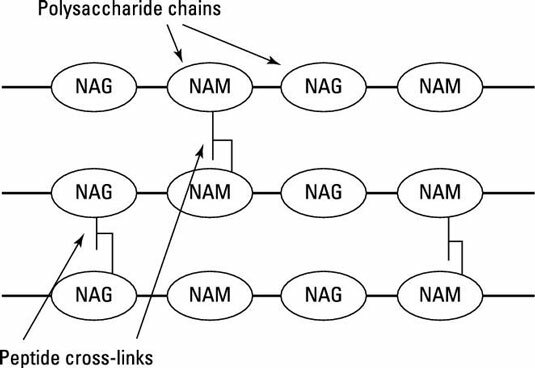 Peptide bridges are covalently linked to NAM sugars. Each individual unit of peptidoglycan is, therefore, a NAG-NAM-tetrapeptide. The peptide bridge can be made up of different amino acids and creates diversity in the peptidoglycan structure between bacteria. Bacteria are classified as either Gram-positive or Gram-negative based on the results of the Gram-stain. Structural differences in peptidoglycan are the basis for this differentiation. Gram-positive bacteria retain the crystal violet stain in the Gram-stain procedure because they have a thick, multilayer sheet of peptidoglycan. Gram-negative bacteria, on the other hand, do not retain the crystal violet stain in the Gram-stain procedure because they have a single, thin layer of peptidoglycan. You can see the image of the two types of cells as imaged by a transmission electron microscope (A) and a schematic representation of the differences in cell wall structure (B). Some bacteria, like Mycoplasma, lack cell walls and are only enclosed in a membrane. Mycoplasma species normally live inside other cells where they don’t face as much osmotic pressure. Their membranes are often tougher than other bacterial membranes because they contain cholesterol. Most bacterial groups that we know of, however, have a cell wall. Teichoic acid is a molecule unique to Gram-positive peptidoglycan and runs perpendicular to the layers of polysaccharide. Teichoic acid is directly attached to the peptidoglycan and is occasionally attached to the phospholipids to form lipoteichoic acid. 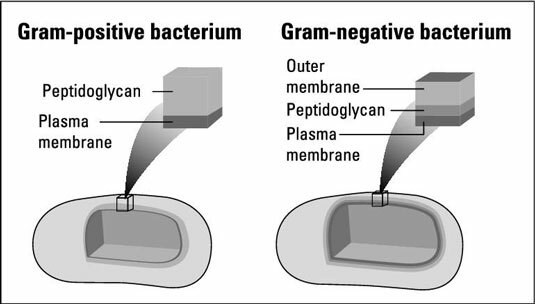 The space between the plasma membrane and the peptidoglycan layer is called the perisplasmic space and is very thin, almost unnoticeable, in Gram-positive bacteria. 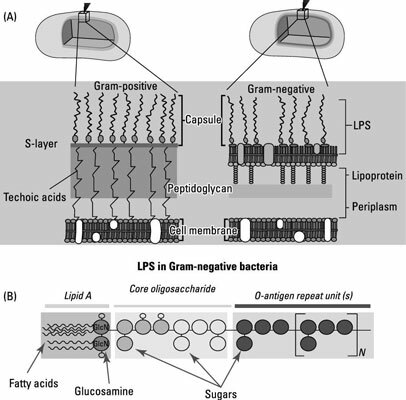 The peptidoglycan of Gram-positive bacteria is often decorated with sugars and proteins that help the bacteria attach to surfaces and interact with the environment. Lipid A: The fatty acid chains in lipid A are attached to a pair of glucosamine molecules (a glucose molecule with an amine group) and not a glycerol molecule, as in a typical phospholipid. Each glucosamine is attached to a phosphate head group. Lipid A is an endotoxin that activates the immune system, causing many of the severe symptoms of Gram-negative bacterial infections. Core oligosaccharide: A chain of about five sugars makes up the core oligosaccharide that is attached to one of the glucosamine molecules in lipid A.
O polysaccharides: Chains of sugars that extend further than the core region are called O polysaccharides (or O antigen). They’re made up of as many as 200 sugars. The type of sugars in the O polysaccharide vary across different bacteria. Archaea, like other single-cell organisms, have tough cell walls that protect them from the environment, but they differ in that they lack peptidoglycan. The cell wall of archaea is most commonly made of surface-layer proteins, called the S-layer. The S-layer assembles from proteins or glycoproteins that form the outermost layer of the cell. Some archaeal cell walls, like those of certain methanogens (methane producers), contain pseudomeurin (pseudo = false, meurin = wall). The chemical composition of pseudomeurin and peptidoglycan differ in the sugars and the amino acids they contain. Other archaeal cell walls have a layer of polysaccharides and provide protection either alone or with an S-layer as well.